On the seventh day (the octave) after feast of St George, on a Thursday[I], in the eleventh year of the reign of Richard II after the conquest, or on April 30th 1388, the Manor of Headington, near Oxford, held its six monthly View of Frankpledge, together with its three weekly Court Baron. This is not the earliest surviving record of Headington[II], but perhaps the earliest record by Headington (Hedyndon), Wick (Vuke) and Marston (Mershton)[III] where we can gain a glimpse into the lives of ordinary people who lived in our community over six hundred years ago. This article explains the cultural, historical background before examining the contents most of which would be otherwise incomprehensible to the modern reader after an interval 627 years[IV] even subsequent to modern English translation from medieval Latin. Finally, it asks the question to what extent, Frankpledge, and the habits of mind so formed, affect us today. Shift click one each of the images and link below which will open in new browser windows, if you click again on these you can zoom to see the image full size. Please note images are copyright as marked. See also the English and Latin Transcript of the the roll. The Black Death of 1348-50 had killed nearly half the population of England and recurred repeatedly notably in 1361–62, 1369, 1379–83, 1389–93 which allowed the surviving peasants to consolidate land and demand higher wages. The ensuing conflict between an establishment attempting to reassert its feudal rights and return to the status quo ante, poll taxes, and the economic and political reality of a more mobile and powerful peasantry lead directly to the Peasants’ revolt of 1381, a mere seven years before, crushed by a combination of both courage bordering on the delusional, and deceit by a 14 year old Richard II. His ensuing reign was marked by conflict with parliament, religious turmoil and financial distress due to an escalation of the hundred year war with France involving Scotland also, civil strife bordering on war cumulating in his probable effective deposition in 1387. By 1388, the affairs of the country had reached a nadir. Far from the rather romantic images conveyed by Chaucer’s contemporary Canterbury Tales[V], the England of 1388 was more bubonic than bucolic. The essential purpose was to ensure communal responsibility for misdemeanours particularly where the individual, such as a villain, could not otherwise be sanctioned by seizure of property – in effect, the whole Tithing would be held accountable for the misdemeanours of any member. By the mid fourteenth century, the Tithing system had to a large degree broken down in many parts, due to disruption from the Black Death, the ineffectiveness of its surety functions, and gradual transfer of policing and apprehension of offenders from all members of a Tithing to officials. Originally it was a royal prerogative consisting of a Sheriff’s Tourn, but during a period of central weakness, some manors were granted the right to hold a Private View, (Morris 1910, p.135) as in the case of Headington, presumably, due to its royal ownership. The “Tithing Penny” was collected from each member of a Tithing, and offences such as assault, nuisances, damage or breaches of the peace were presented by the Chief Pledges or Head-Tithingmen (decenarii) who represented the Tithing and traditionally formed the Jury. The Assessors, (afferatores) decided the “amercement” (amercementum) with the amount written above the person’s name and in the left margin for ease of adding up the total. The offender was then considered “in mercy” (in misericordia) of the court. In principle, every member of a Tithing was compelled to attend, three non-attendances were permitted where excuses (essoinia) were permitted after which he was considered “in default” (fecit defaultam) and would have to pay a fine. Pleas of debt, trespass, or breach of promise were heard between defendants and accusers, which could be resolved by a licence to agree (licencia concordia), which involved a fine payable to the Court. All freemen (the homage) in the manor owed suit to Court Baron. The Manor of Headington was a royal manor since Saxon times. 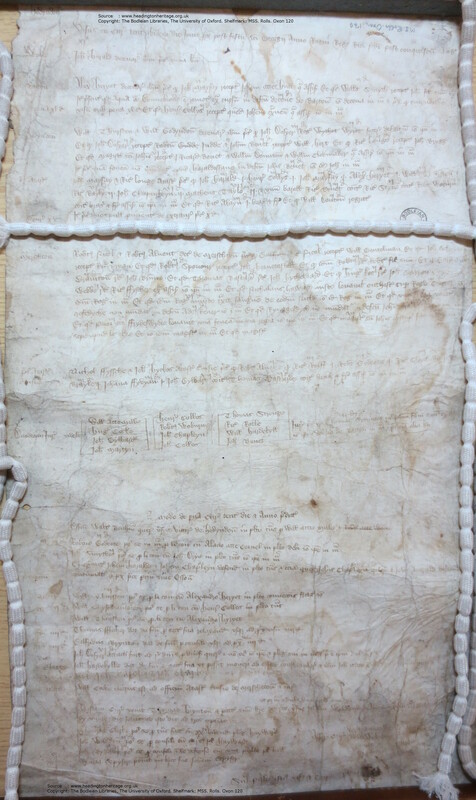 This Court Roll confirms (Evans 1928) that its writ ran to the vills of Wick, Headington and Marston as far as St John’s Hospital (Wood 1899, Vol II, p.529) formerly on the current site of Magdalen College just before the East Gate of Oxford, and probably to the North Gate Hundred, to the immediate north of Oxford. Donnebrok (l.5) (Donnebrook, or ‘Don Brook, Headington Brook, or ‘Edenebroke) is Bayswater Brook near the future Barton Park development. [VI] (Roberts 1964, p.64) Possibly Danesbrook, which is a tributary, is a corruption the original name. The manor was alienated from the Crown to a succession of owners from 1317, cumulating in 1375 with three heirs to Sir Richard d’Amory – his sister Elizabeth, Roger Colynge, husband of another, and John de Annesly, who had married a daughter of another sister, at a rent of £81 per annum. This was “extraordinarily high” (ibid, p.172), and in 1379 an order, subsequently rescinded, of distraint or distress was issued against all men of the manor which would have enabled seizure of their property for payment. Finally, in 1399, the manor lapsed to the crown for non-payment of rent. The two titles, and the common ending (PURPLE) “sum of the profits of the View and Court” indicate clearly these were regarded as separate, even if they shared the same Lord(s), Steward, Assessors and probably Jury. The date is typically expressed by regnal year, religious feast and Octave, which was eight days including the actual feast day, so seven days afterwards on a Thursday. At the View, the Head-Tithingmen (decanarii or Chief Pledges) present the offences to the Jury. The twelve man Jury has been sworn in, and boxed, in groups of four (l.28) (Stuart 1992, p.2) as shown by the three columns of names. The three columns of four Jurors do not correlate to the three vills, although the middle group is overrepresented in Headington. The Lord had to ensure a minimum of twelve Chief Pledges/Jurors in order to maintain his feudal right to a View, regardless of the number of Tithings. The View is divided into the three Vills of Wick, Headington and Marston (RED boxed) each with a corresponding Tithing, Wick and Barton having one Chief Pledge each, and the larger Headington and Marston having two each – these latter each having sections for the presentments of the Ale Tasters. The Curia Baron,(GREEN) section consists of disputes, most prominently trespass. Headington may have had a classic three or four field (eg: Brockholes, Quarry and South) strip farming Champion system, and transgression over unclearly marked boundaries appears frequent. In the election section, a Constable, responsible for maintaining stocks and means of punishment and dealing with vagabonds and other duties gives notice, and an Ale Taster (see below) is elected for Marston. Line 45 confirms this court was held three weekly, in this case on the same day as the six monthly Court Leet. Many are reported for “receiving” guests in their dwellings and fined. This appears to be a very strict interpretation of the Assize Of Clarendon (1166) [X], which was aimed mainly as fugitives from justice and vagabonds. And if he shall have been there more than one night, he shall be taken and held until his lord shall come to pledge him, or until he himself shall procure safe pledges; and he likewise shall be taken who shall have entertained him. Twenty persons were fined for breaches at Headington (12 persons) and Marston (8 persons) including the Regrator, who sold the beer. This offence appears commonly in rolls of this period. In common with most Views of this period offences such as diverting the Donnebrook (l.5), raising a ditch[XII] on the King’s highway, not maintaining ditches near Harold’s Lane (l.10) and on the river Alde (l.21), and Croft [XIII] and Ryigges Ditch (l.20) are common. “they shall levy hue and cry upon them, and such as keep the watch shall follow them with all the town and the towns near, with hue and cry from town to town, until that they be taken and delivered to the sheriff as before is said; and for the arrestments of such strangers none shall be punished. Raising a “Hue and a Cry” was dangerous, as, if unjust, a fine could be imposed. The failure of the Peasant’s Revolt only nine years before, may have been a bitter disappointment to many. A weak economy, a king effectively deposed, and the heavy exactions both of the state and a Lord(s) attempting, and ultimately failing, to raise £81 a year in rent payable to the King allow us to speculate that Headington was a thoroughly miserable place to be in 1388. Weighed against this is a greater freedom and economic wealth the Black Death had brought to those who had survived, and the clear evidence in the roll of a large number of guests, possibly an indicator of economic activity such as quarrying or mining, which allows a tentative conclusion that Headington, at least relative to other parts, was economically well off. It is dangerous to interpret the concluding phrase “sum of the profits of the view and court” (l.50) too literally across both language and time, yet perhaps the tourne de phrase is not entirely coincidental. The relationship between the Headington Courts is clearly a hybrid between the classic “View” and Court Baron and an evolution towards a system recognisable today. It appears both have jurisdiction over all, or most inhabitants of the manor. To which can be added the legal evolution wrought over centuries. The Jury members are local men, as evinced by some of their number in effect finding themselves guilty of the offences and involvement in pleas of trespass both as defendants and plaintiffs. It may seem strange that office holders and Jury members are themselves reported for “offences”, for example, John Mayfly, Ale Taster reports himself for committing the very offence he is charged to police, brewing. However “receiving” and “brewing” were cavalier “crimes” which were, in effect, a form of licencing a power abused by the Lord to raise revenue and represent the overwhelming majority of cases and fines imposed. The Manor is in effect not only imposing a hotel or bedroom tax [XV] for receiving guests in their hovels, but even the Master of St John’s Hospital possibly for patients under its care. As exploitive as the system already was, the Lord was attempting, and ultimately failing, to pay an exorbitant rent to the King of £81 a year. The exactions of the Lord are clear, the quid pro quo is not. It is not clear, beyond maintaining law and order, what service the Lord did his tenants. At this period, the collective responsibility element integral to Frankpledge was breaking down, however the entire Tithing of Barton will have to pay an exorbitant fine of 40 d (pena) if the diverted Donnebrok (Bayswater Brook) is not repaired or possibly the perpetrator identified. After John Dosyer is reported absent in the View (l.7), in the Court Baron (l.46 – 48), it is noted he reported already attached, whereby his goods or even person can be apprehended, and both his property, and those of his Pledges are subject to Distraint or placed under the control of the court, and may be seized for non-payment. None of these however, are Capital Pledges or Head-Tithingmen, and the surety offered appears little different to that of a loan guarantor of today. In view of both their social and religious status it is notable that these Courts impose amercements on the Master of St John’s Hospital[XVI] (receiving, blocking a drain, (l.21)) and the Prior of St Frideswide’s[XVII] raising a ditch/embankment (l.21) and hear a claim of trespass against the Vicar of Headington (l.31) as defendant. In the case of St John’s, it seems to have been specifically granted freedom from such obligations (Wood 1899, Vol II, p.522) as more generally had religious persons and institutions. This was a man’s world, the Tithings were composed of men acting as heads of households, as are all the office holders. Of the slightly less than 100 protagonists named, only two women, or 2% of the total appear. One, Johanna Fabian (l.24), appears as an illegal brewer [XVIII] and another, Agnes Spicer puts a man “in her place,” to represent her (l.49). Johanna cannot complain of unequal treatment however, she fined the same as her co-defendants. William Clockmaker (l.9) is of interest, simply as there were not many clocks to be made in fourteenth century England. As he was a guest at St John’s near Oxford, perhaps he was undertaking a particular commission for an ecclesiastical building. In principle, it should be possible to estimate population by simply multiplying the number of Head-Tithingmen by ten for the number of households, and, say six per household. We can therefore very tentatively estimate the total population at (4 Chief Pledges * 10 households *4- 6 persons per household) + others of too high a social status to be entithed, say 60, so very approximately 200 – 400 persons altogether. The roll is written in cat-sat-on-the-mat or anglicised Medieval Latin. An inflective language where word order is less important than the endings of the words, a Roman could say “cat mat sat,” or more emphatically “mat, cat sat” but “the cat sat on the mat” even if grammatically correct, would have left him wondering if he had walked onto the set of Plautus’s long lost play “’alve, ’alve” or “’ello, ‘ello” reading the Latin used nearly a thousand years after the withdrawal from Britain traditionally in 410 A.D. Backwards Latin did not necessarily involve black magic in medieval England. Medieval contraction, suspension and abbreviation would shame even the most dedicated user of social media and is very heavily used as is common in the period, however its ostensible purpose of saving space is at odds with the large gaps and extensive margination. The scribe, in contrast to the other protagonists, appears neither local nor particularly competent. Frequent crossing out of names indicates unfamiliarity either with the names or possibly even the local accent, some sentences seem to just peter out, there is much addition and annotation. The quality is poor, even very poor – in contrast to many rolls of this period with mellifluous phraseology and decorative styles there is an almost complete absence of flourishes or decoration. “Serua” or “Serva” is pronounced” ser-w-a” in contemporary Latin pronunciation, so “Vuke”, for the modern hamlet or farm of Wick near Barton is phonetic. Why should we concern ourselves in 2015 with the Headington Court of 1388? What relevance does it have to us? The Tithing and Frankpledge system, although founded on tradition, was very much the result of conscious decision on the part of many rulers over a protracted period of many centuries to enforce public order. The fundamental question remains, is to what extent does it influence us today? Did the imposition, at least in part by a foreign elite of Norman invaders, of enforced communal responsibility for the actions of others, increase our sense of community and civic mindedness to the extent we would rather report the infractions of our neighbours and relatives to the authorities rather than find amicable resolution, thereby engendering mutual distrust and antipathy, or create a society that valued principles and law over personal ties creating a fairer society, or produce generations of sneaks and toddies with no thought of fraternity and shared common interest? The very first, and shortest, presentment, from Wick “all is well” indicates at least one community may have valued personal relationships and family over legal niceties. By submitting to the parlous, even usurped legal authority of the Lord of the Manor did we create a society that accepts unfairness and inequality, thereby hindering the development of a fair, just and equitable society, or by doing so did we barter fairness for practicality, and a slower but more peaceful evolution of society with a respect for the law however imperfect, largely devoid of the revolutions and destruction of others? COKE, E.,Sir, 1650. The compleat copy-holder electronic resource] : wherein is contained a learned discourse of the antiquity and nature of mannors and copy-holds, being a guide and direction for surrenders, presentments, admittances, forfeitures, customes, &c. London: London : Printed for W. Lee and D. Pakeman ..
CROWLEYE, D.A., 1975. The Later History of Frankpledge. Historical Research, 48(117), pp. 1-15. FISHER, R.B., 1794. A practical treatise on copyhold tenure, with the methods of holding courts leet, court baron, and other courts: and an appendix, containing forms of entries on court rolls, and minute books; … By Richard Barnard Fisher, .. London: London : printed by A. Strahan and W. Woodfall, for J. Butterworth. GOODER, E.A., 1961. Latin for local history : an introduction. London: London : Longman. LARSON, P.L., 2010. Village Voice or Village Oligarchy? : The Jurors of the Durham Halmote Court, 1349 to 1424. Law and History Review, 28(3), pp. 675-709. LATHAM, R.E., 1999. Revised medieval Latin word-list from British and Irish sources. London: London : Published for the British Academy by the Oxford University Press. MCKINLEY, R.A.(., 1977. The surnames of Oxfordshire. Oxford: Oxford : Leopard’s Head. MORRIS, W.A., 1875-1946, 1910. The frankpledge system, electronic resource]. New York ; London: New York ; London : Longmans, Green. RAZI, Z., SMITH, R.M., 1946-, RAZI, T. and SMITH, R.M. (.M., 1946-, 1996. Medieval society and the manor court electronic resource]. Oxford: Oxford : Clarendon. ROBERTS, E., 1964. The boundary and woodlands of Shotover Forest c.1298. Oxford: Oxford : Oxford Architectural and Historical Society. FRIDESWIDE’S MONASTERY., 1896a. The cartulary of the Monastery of St. Frideswide at Oxford – General and City Charters. Oxford: Oxford : Printed for the Oxford Historical Society at the Clarendon Press. STUART, D., 1995. Latin for local and family historians : a beginner’s guide. Chichester, West Sussex: Chichester, West Sussex : Phillimore. STUART, D., 1992. 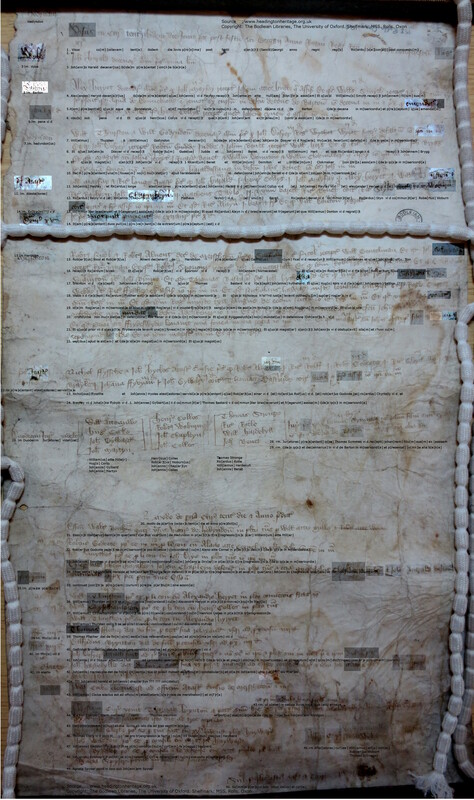 Manorial records : an introduction to their transcription and translation. Chichester: Chichester : Phillimore. The very substantial logistical help of the University of Oxford and its staff is very gratefully acknowledged, in particular, attendance at a Palaeography Course. Permission to use images without charge by Oxford University is yet again, very gratefully received. The author has no academic status or qualifications in history and no other help has been received, therefore all misinterpretations and erroneous conclusions remain his alone. This is the first attempt at Latin translation outside of a classroom – any corrections to material will be gratefully received and acknowledged. Angle brackets such as [con][tra] have been used to expand abbreviation, suspension and contraction marks – these are well documented in standard Palaeography texts, but are frequently nonetheless ambiguous. Standard curved brackets are used where words have been assumed. For example, recept[abbr] may have meant “recepta”, not “recepit” but the latter is correct. A native English speaker may well think “received” is the same whether used adjectively, actively or passively, although it most certainly is not in Latin. “Item pres[entat/presentum]” means “likewise presents or presented” some authors expand as “Item presentum [est]”, but as there is no “n” or “m” expansion mark the former is used. Names are translated to their nearest modern English equivalents, for example “wyuet” is changed to Wyatt. “lm” and “rm” stand for left and right margins. 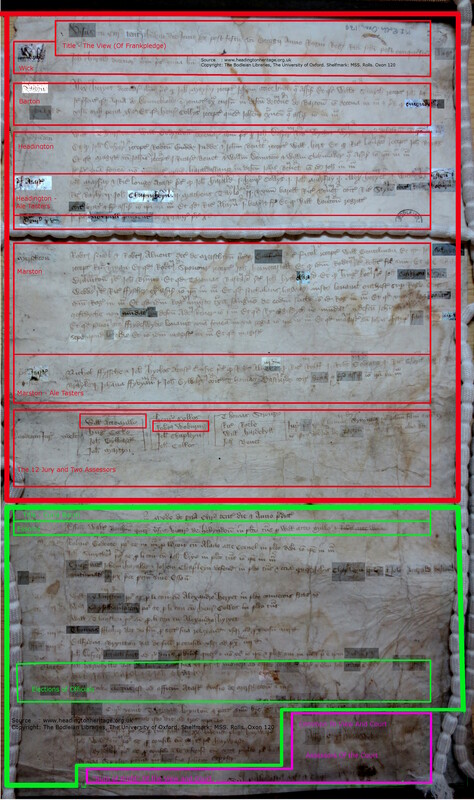 The “MS Roll – With Annotated Latin Transcription” was digitally manipulated by increasing contrast and darkening, and applying other treatments in different areas, this worked well at the top of the document but less so at the base.